A hundred and fifty years ago the United States was at a crossroads of change. Southern states found themselves leaving the Union and Civil Unrest engulfed this nation with a bloody conflict known as the American Civil War. 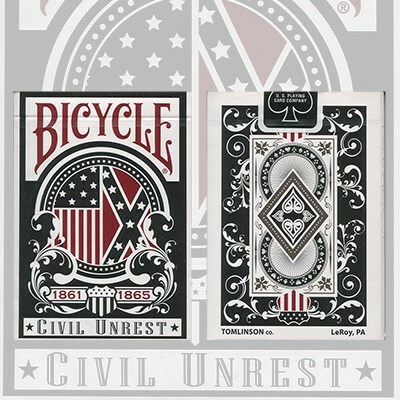 Now there's a deck of playing cards to honor that moment, Bicycle Civil Unrest. This deck of card pays tribute to the people that lived and fought during this time period in American history. Civil Unrest is a limited edition run consisting of two tuck cases. One tuck case represents the Union while the other represents the Confederacy. In addition to two seperate tuck cases, this deck features two title cards, two ad cards naming who's who within the court and a special gaffe card which consists of one of the ad cards having a back with a color scheme of to match the Confederate tuck case. In addition, the jokers are designed to be placed side by side to form a larger image of two Civil War boats firing upon each other. Two tuck cases representing the north and south. All cards have real civil war maps within the backgorund of the card. Entirely custom courts and pips. The jokers can be placed side by side to form a larger image of two boats firing upon each other. Two title cards: Ace of spades for the southern states (with Bicycle logo) and Ace of hearts for the nothern states (with Bicycle logo). The back of the Confederate ad card has a color scheme to match the Confederate tuck case (used as gaffe card). The two ad cards says who's who within the deck of cards.